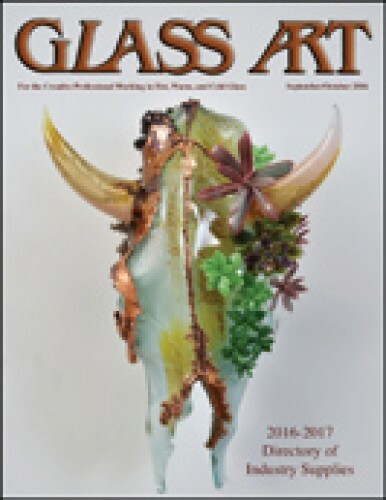 Glass Art editor Shawn Waggoner reminds readers that the annual Directory of Industry Supplies issue is here once again. This comprehensive listing, available in print and online, provides a way for artists, retailers, and suppliers to connect with one another and make the buying and selling process mutually beneficial. Grant Garmezy blows high-end realistic glass sculpture with distinctly Southern imagery. His story is one of a young artist making his way through various mediums and recounting the challenges he navigated to establish himself as a professional artist. He emphasizes the fact that artistic success doesn’t happen overnight. On February 1, 2016, The Corning Museum released its first-ever scholarly electronic resource, The Techniques of Renaissance Venetian Glassworking by artist and scholar, William Gudenrath. The culmination of a lifetime of research, this digital resource details the techniques used to make glass on the Italian island of Murano. London Glassblowing, a leading hot glass studio and gallery, was excited to host the 2016 Contemporary Glass Society (CGS) exhibition, Black to White & Back Again. For this exhibition, CGS members were challenged to strip away all color and work in monotones in response to this unusual exhibition. The Gallery of Excellence at the 22nd Annual Glass Craft & Bead Expo was once again co-sponsored by Glass Art and sister publications, Glass Patterns Quarterly and The Flow. Entries for the professional and amateur categories, and those from local high schools, astounded viewers with the beauty and skills demonstrated by the artwork. Taylor Materio learned a solid work ethic helping in the art glass retail business operated by her parents, Shannon and Phil Materio. This millennial is now carrying on the family business and rethinking retail methods and glass classes that will draw potential clients among her own generation to the business. Graal is understood as a technique of interlayer decoration. On October 30, 2016, international glass historians and experts will meet during a one-day colloquium to pursue Graal glass and its variants to discuss the interface of design, glass art, industry, and craft. 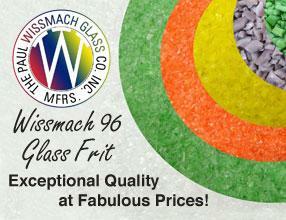 All of the courses will be led by experienced glass artists. The northeast corner of Spain, known as Catalonia, looms large in the worlds of art and architecture. Its Palau de la Música is anything but your average concert hall and is filled with wondrous works of stained glass, including the concert hall skylight, fabulous windows, stage decoration, and stairway details. The Mosaic Marathon, an integral part of the annual conference of the Society of American Mosaic Artists, creates a finished mosaic each year to be donated to a local charity or needy establishment in its host conference city. The 2016 recipient was the St. Madeleine Sophie’s Center in El Cajon, Calofornia.